Never Enough Nails: Lynnderella Friday, Vol. 45, Bridal-Themed Lynns! 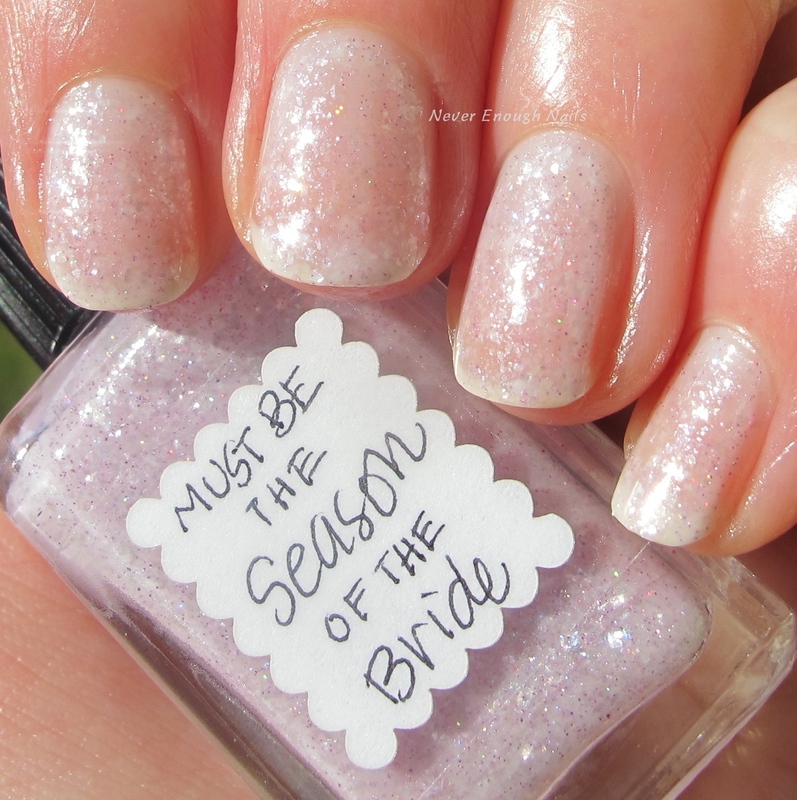 Today I have two polishes from Lynnderella that would be perfect if you are getting married this spring/summer! If, like me, you are not getting married, they are still quite beautiful! Lynnderella Must Be the Season of the Bride is a soft white pink shimmer with white flakes. Lynnderella describes it as "pastel translucent pink with extra shimmery white flake pigments as well as blue sparks and multishimmer". The blue sparks and multi-colored shimmer are really beautiful and more pronounced in person. They add a nice dimension to this polish. This is two coats, easy application, and I like the coverage here. It is on the sheer side, but it's definitely supposed to be sheer, and it has nice even coverage, so it looks good this way. 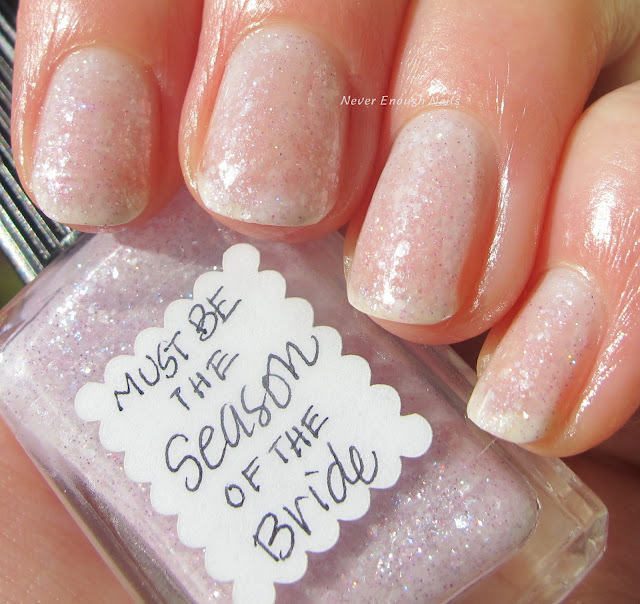 I'm not usually into sheer polishes, but I love this! I think having all the shimmer and flakes in there makes it prettier! 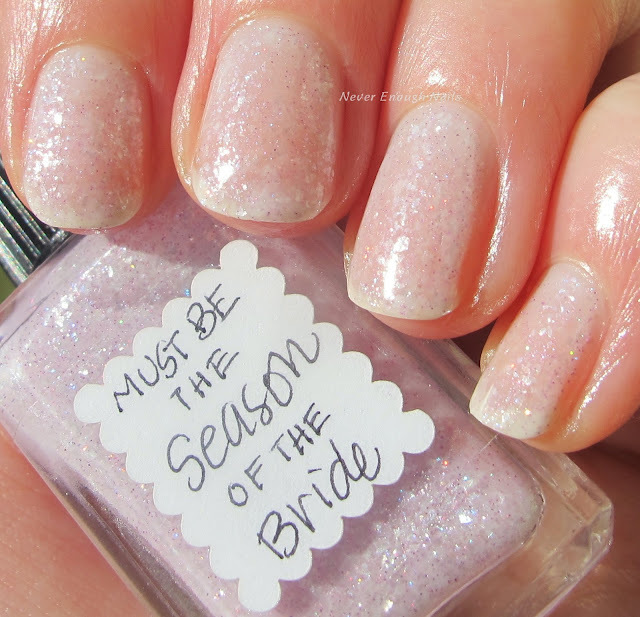 Lynnderella Honeymoon Sweet is a glowing translucent pink shimmer with tons of iridescent fire opal glitters. I have been loving these fire opal glitters in other polishes and I feel like they really get to shine all alone in this polish. The pink shimmer makes my nails look nice and healthy too! This is three thin coats. Again, I am not one for sheers, but I love this! The pink shimmer makes my nails look great and the fire opals are stunning. The coverage is even and it was easy to apply. Both of these lovely polishes are available now at http://stores.ebay.com/lynnderella-lynnderella. Please note that lynnderella.com will soon stop redirecting to the eBay store, so please use http://stores.ebay.com/lynnderella-lynnderella to get to the store from now on! !